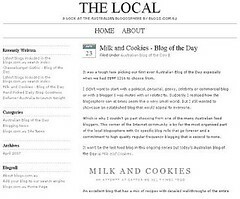 It seems that I have been baking a lot from blogs lately. But who can blame me; I suffer from an overload of recipes from so many food blogs that continually tease and entice me with their recipes. And my eyes are never satiated; my bookmarks are full of recipes that I have spied, salivated over and envied and the list keeps growing. So what I decided was that it was high time I start tackling some of those recipes rather than just letting them go to waste. If my online bookmarks could gather dust, I assure you there would be a thick mantle of dirt that no feather duster could remove. 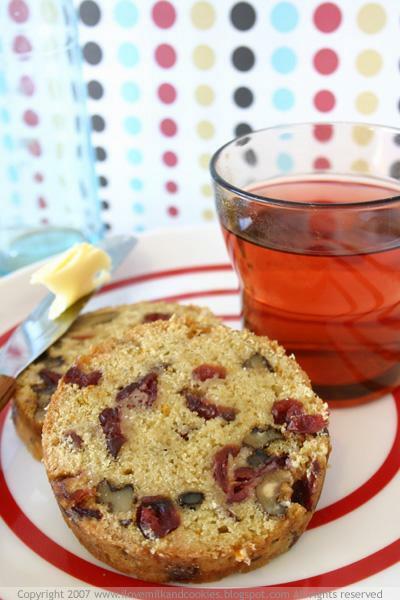 So before virtual cobwebs start to form on these recipes, here is one of the oldest ones that has been sitting there for almost as long as this blog has been alive- Elise’s Cranberry Nut Bread Recipe. Now it not only seems that I have been baking from blogs lately, but it also appears that I have been baking with cranberries a lot too. I just can’t get enough of them, which I surmise is a probably a good thing for the waist, as now, instead of peering into the pantry and reaching for a packet of something no-so-healthy, I find myself reaching for that packet of dried cranberries. I’m sure my body will thank me for it at some point. A reader did ask me not long after the past two cranberry posts whether there was a cranberry craze going on down here in Oz. Well the answer is, no there is no such craze, although it looks as if the craze is going in my kitchen. To be honest cranberries aren’t at all a craze down under, and to think of it, cranberries seem more of a North-American thing (kind of like egg-nog) as it’s used in a lot of their holiday cooking, like Thanksgiving. I have actually never ever seen fresh cranberries in the shops or the markets, and if Australia does grow Cranberries, well I have never come across them. My entire experience with the cranberry has solely been through the dried and the tea variety, and at times at the deli when I buy a turkey panini that comes with a nice slathering of cranberry sauce in between. Other than that, this berry is quite foreign to me. 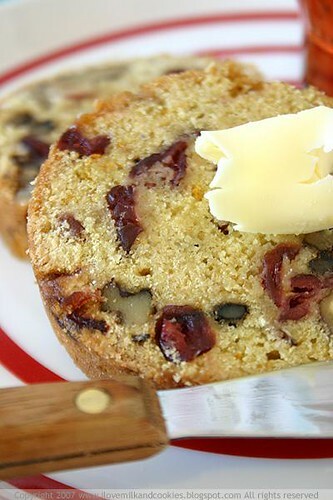 So when I saw this recipe for Cranberry Nut Bread, I was quite excited to be able to use the dried cranberries that had been sitting in my pantry for quite some time. 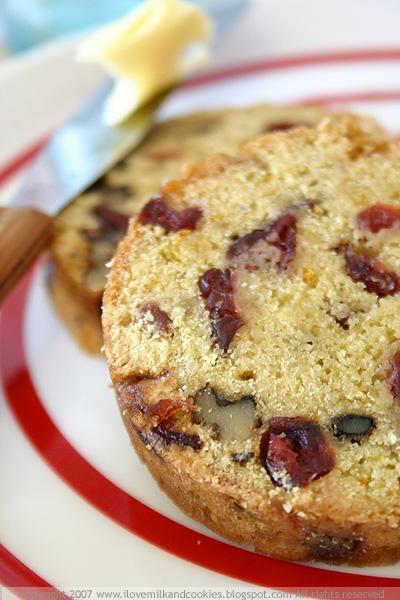 If you like fruits and nuts in cake then this is definitely for you- sweet, nutty and tangy all in one slice. I had mine with a cranberry and apple tea, but if that’s too much cranberry for you, then I think a nice Darjeeling or Russian Caravan will make a nice accompaniment. I baked this bread in a rounded loaf tin but purely for aesthetics; you can just use an ordinary loaf tin if you wish. Mix the flour, sugar, baking powder, baking soda, and salt in a large mixing bowl. Mix together orange juice, butter, egg, and orange peel. 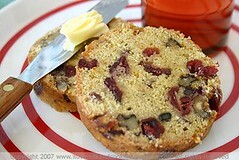 Add to flour, cranberry, nut mixture and stir with a wooden spoon until just blended. Pour into a greased 9x5 or 8x4 loaf pan. Bake at 180°C for 55 to 60 minutes or until done (when a toothpick inserted into the centre comes out clean). 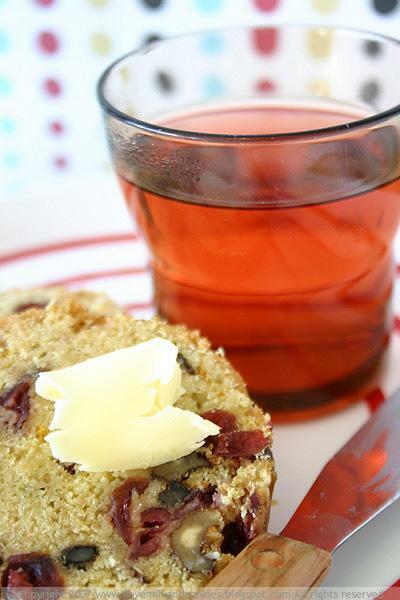 Slice and serve with butter and tea. ADDED NOTE: For those of you who have been asking where I got these gorgeous paper cases, you can buy them at any specialised kitchen/baking supply store. If you are from NSW, VIC or the ACT then it will probably help to know that I got these ones from The Essential Ingredient. Contrary to what the title suggests, this cake never came to me through any sort of serendipity or eureka. It was by no means an inadvertent light bulb moment, but simply came about through pure chance; completely unintended and coincidental. Yet through this fortuity, this cake has afforded itself as one of my favourite gastronomic finds of late, tipped to become a staple in my kitchen and on future menus. The story of how the cake found its way on my kitchen table starts several months ago after receiving an email from a reader, K. She was looking for a “chocolate marbled pistachio cake” that she stumbled across while skimming through several food blogs, but could not remember exactly where she found it. She suspected that perhaps the recipe was posted on my blog. After disappointing both her and myself that no such recipe was posted on this blog, I sent off a reply bidding K good luck in her search. 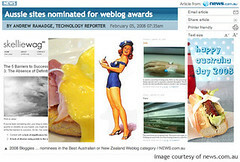 And as luck would have it, I received another email from K not long after, informing me that she found the recipe after all- at this blog. 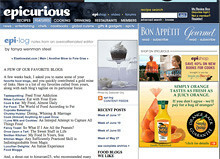 To be embarrassingly honest, I didn’t care much that K had found the recipe she had earnestly been looking for; I was too busy being secretly flattered that she would even mistake my blog for Heidi’s. It’s quite laughable, especially when they are eons away from each other in more ways than one. So after being more than pleasantly surprised, I skip over to the exact post. That is where fate takes it’s course and the rest is as they say, history. As chance would have it, I immediately fall in love with the cake. If love at first sight could be had between one and a cake, then I can vouch that it was one of those moments. I have only made this cake once, but at the risk of sounding morbid, if a gun was pulled to my head and it was demanded that I could only make one cake for the rest of my life, this would be the one. As drastic as that sounds this cake is worth forsaking all others. It’s enough to force cake-monogamy on anyone and if you haven’t tried it yet, then you won’t really understand what all this swooning and gushing is all about. 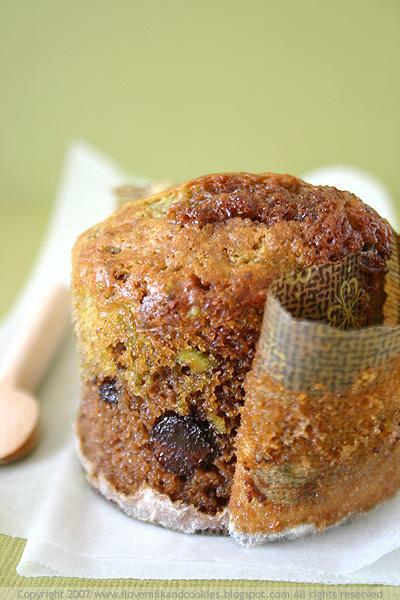 The cake consists of two layers, a moist chocolate cake and a fluffy pistachio speckled cake on top and sandwiched in between is a thin layer of melted chocolate chips. The flavour equation is quite simple but utterly genius at the same time, chocolate and pistachios marry incredibly well together. 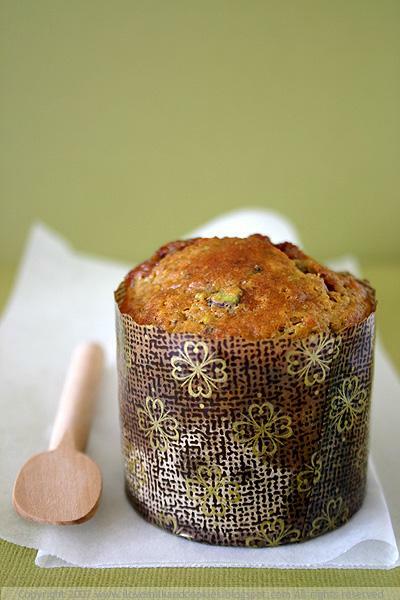 The recipe is the brainchild of baker/blogger extraordinaire Clotilde of Chocolate and Zucchini. From Clotilde to Heidi and then to me, the cake has gone through a few transformations but the effect remains unchanged, luscious, calorific indulgence. The beauty of this surprise cake is that you can modify the “surprise” to fit your fancy. 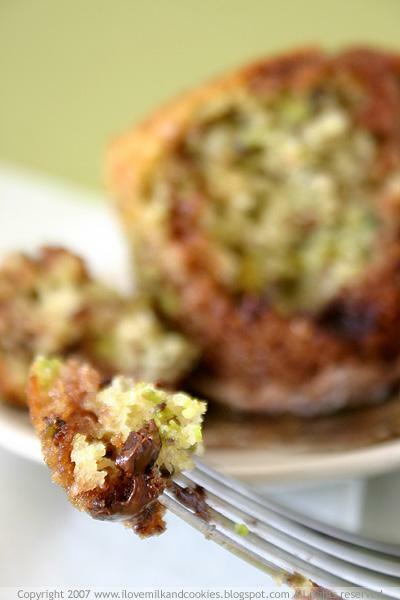 You can, like Clotilde, envelope the pistachio batter in the chocolate and create a pistachio- green surprise with a little chocolate swirl inside; or like Heidi, cover the chocolate batter with the pistachio one to create a chocolaty surprise. In these little individual cakes, I decided to make the melted chocolate centre the surprise, so I increased the amount of chocolate chips I used to 1 cup so that the melted chocolate layer would when digging into the cake be considerably pronounced. This I found worked out in my favour after “oohs” and “ahhs” resonated across the dinner table at the discovery of the gooey centre. The cake was a resounding triumph and the benefit is it comes with little effort. Indeed, you have to make two separate batters but if you have an electric mixer or food processor, most of the work is done at the push of a button. I won’t talk about the cleaning up after; let’s leave that to your imagination. This seductive treat is sure to turn anyone’s affections, and if you were in fact seeking to turn someone’s affections, then this would be the perfect lure. I hope that you do get to try this cake some time; whatever surprise route you wish to take, the guarantee is that it never disappoints. This is one accident that I really am glad happened. Thank you K.
This cake is also my entry to this month's SHF: The Sweetest Thing- a call for all bloggers to submit all their can't-live-without dessert recipes. 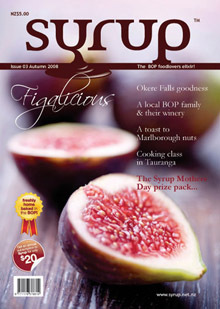 Check out the round-up coming soon on The Domestic Goddess. Preheat oven to 180°C. 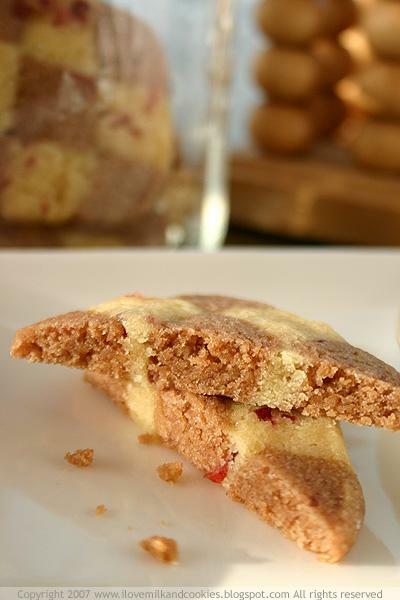 Grease a 25cm springform cake pan, or alternatively prepare 12 small paper cake cases. Prepare the chocolate batter first. In a food processor mix together half of the sugar, butter until fluffy. Add in two eggs one at a time, pulsing in between each addition. Add in half of the yoghurt and the vanilla extract, pulse again. In a medium bowl, combine half of the flour, baking powder, baking soda and all of the cocoa powder. Add the flour mixture into the food processor and mix again until the flour is just incorporated. Pour the batter into the cake pan, or if you are using the paper cake cases, then using an ice cream scoop, place one scoop of batter into each paper case. Place the chocolate batter into the fridge. 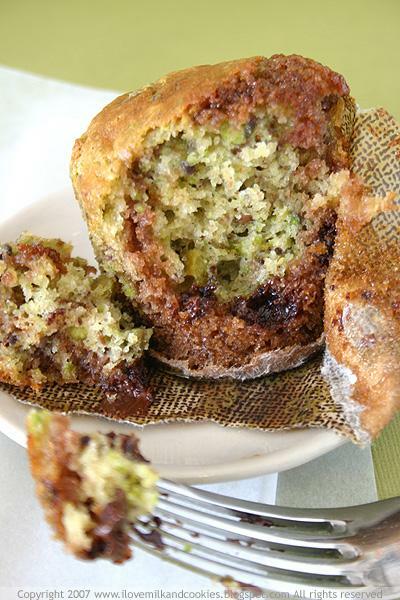 Rinse the bowl of the food processor and prepare the pistachio batter. Mix together the rest of the butter and sugar until light and fluffy. Add in the last two eggs one at a time, pulsing in between each addition. Add the remaining yoghurt and pulse again. 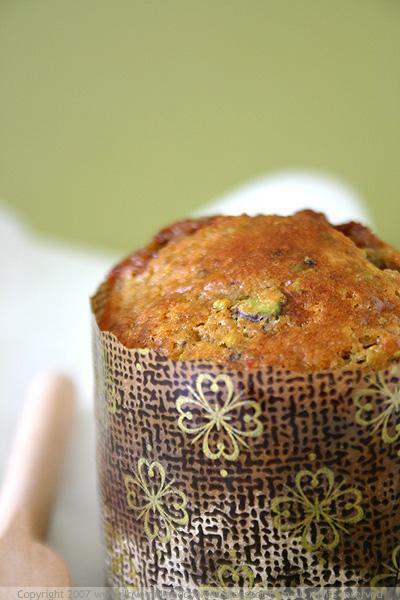 In a medium bowl, combine the rest of the flour, baking powder, baking soda and all of the chopped pistachios. Add this flour mixture into the batter and process again until the flour is just combined. Remove the chocolate batter from the fridge and sprinkle the chocolate chips evenly and liberally over the surface of the batter. 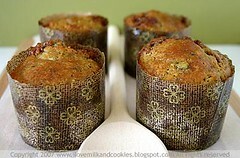 Gently pour over the pistachio batter on top of the chocolate chips, or alternatively if you are using the paper cases, then use an ice scoop to place the pistachio batter on top. Smooth out the surface using a spatula. Bake in the oven for 50 minutes, or if you are making the individual cakes, then for 30 minutes or until a toothpick comes out clean. Allow to rest for 5 minutes then turn out onto a wire rack to cool completely. If you have been reading the last few posts, you will have noticed that I have been chronicling this saga that we in Sydney have come to know as the weather. We’ve seen it all; being at the mercy of some sort of meteorological cataclysm, we’ve seen everything from rain to cyclones, to furious winds and even snowfall. After all the beating we endured in the last two weeks, it’s nice to see that rain clouds have finally been benched in favour of some sunshine. Although we’ve been told that this genial weather will be short-lived, it’s safe to say that sunshine is finally back in the game. During all this bad weather, I started a so–called series of cookies from The Australian Women’s Weekly cookbook that I have been baking from while stuck indoors. 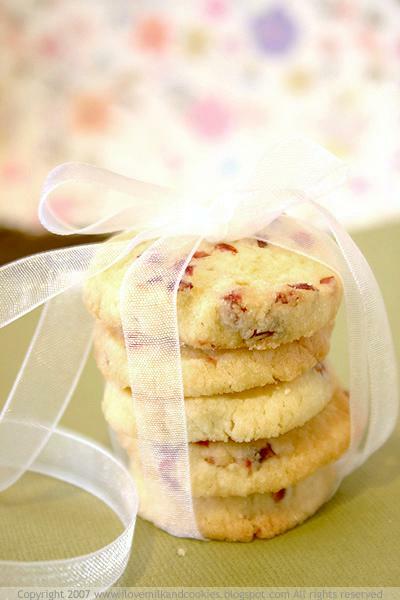 So to cap-off this cookie trilogy of sorts, here is a recipe for cookies that comes full circle. 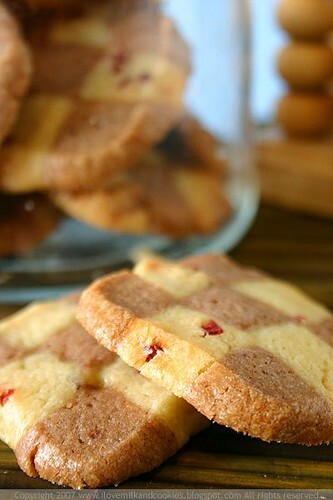 Although these cookies are actually square, I use the same type of dried cranberries as I did in these first ones, but this time paired with chocolate. 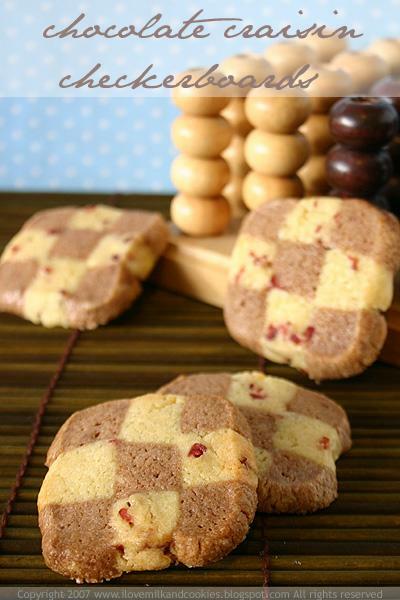 These Chocolate and Craisin Checkerboard cookies are more of a novelty than a necessity I must say. It’s the kind of cookie you probably make more for the frivolity of its appearance than its taste. Not that there is anything terrible about the way they taste, the contrary in fact, although they are quite fiddly and time consuming and are probably the kind of cookie you make when you have exorbitant amount of hours to lazily spend baking at home. Something I did have lots of in the last week. Chocolate goes surprisingly well with cranberries. I was quite skeptical at first, I don’t know why because the combination is without doubt mouth-watering. Although the time it takes to construct your checkerboards and get through the two rounds of refrigeration, then you will probably be happy to be eating anything, whatever it tastes like. 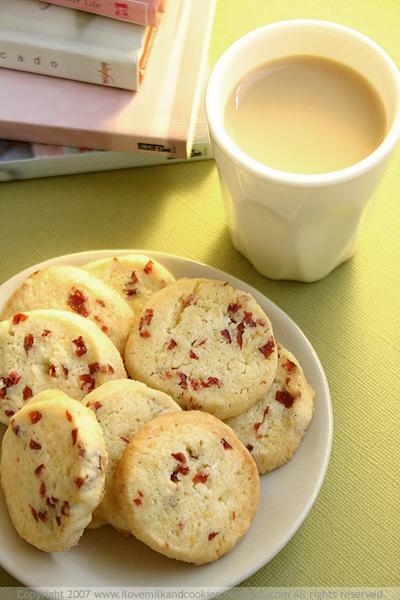 Aside from the time it takes to make these cookies, the rewards for this charming is fairly obvious. Just make sure you have some time on your hands to work with the dough. Beat butter, sugar, vanilla extract and egg in a bowl with an electric mixer until light and fluffy. Stir in sifted flour in two additions. Divide the dough equally in half and in one half mix in sifted cocoa and in the other half knead in lemon zest and craisins. Using a ruler, shape each batch of dough into 4.5cm x 4.5cm x 15cm rectangular bars. Wrap each bar in baking paper and refrigerate for 30 minutes to an hour. Remove bars from fridge and cut each bar lengthways equally into three slices, then cut each slice lengthways equally into three; you will have nine 1.5 x 1.5 x 1.5 slices of each dough. Brush each slice of dough with egg white and stack alternate flavours together to recreate the log. Repeat with second log. Refrigerate logs for another 30 minutes. Preheat oven to 180°C. Prepare a baking tray with parchment paper. Using a sharp knife cut each log into 1cm-thick slices. Place cut-side up on baking trays about 5cm apart. Bake cookies for about 15-18 minutes. Stand for 5 minutes before lifting the cookies from the tray. As the rains continue to pour over Sydney, it appears that most of the city has occupied itself in the business of talking about the weather. It has become somewhat of a national sport, where strangers who normally would have no business talking to each other find themselves engaged in conversation about the wild weather. While Sydney engrosses itself in a collective dialogue about climate conditions, predicted rainfall and dam levels, allow me to put my two bits in- in the form of biscuits that is. With all this wet, dreary weather, what one desperately needs is a good dose of comfort eating, something to cosy up to on the couch and of you're lucky in front of a fireplace. 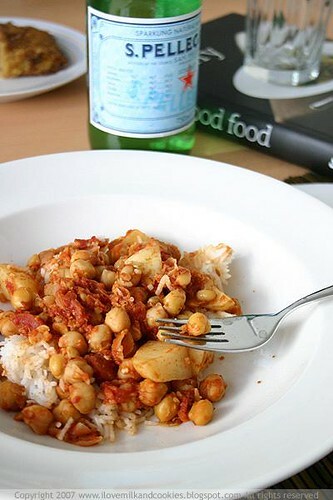 Now if you are thinking, warms stews and hearty casseroles, then you are at the wrong blog. Although stews and casseroles are probably the perfect remedy for a cold winter's day, I am the kind of blogger that usually turns to something sweet on a day like this. On cold days, carbs are my best friend. So another miserly winter's day is spent at the helm of an oven. As I write this post in my warmest winter woollies, there is a giant mug of tea at my side- a requisite for any cold day in my opinion, a plate of biscuits and some caramelised garlic bread just an arm’s length away, just waiting to be ripped apart. The bread is from the much-lauded Brasserie Bread in Botany Bay; quite a trip away from the suburbs, but their caramelised garlic bread is worth the traverse. Their garlic bread is made with a rustic style Italian dough with whole caramelised garlic pieces tucked in between layers of dough, then finished off with a varnish of garlic, pepper and balsamic vinegar glaze. I assure you it tastes a lot better than it sounds. The biscuits are Lemongrass, Ginger and Sesame biscuits; a recipe adapted from the same book where these cookies were also from. Somewhere amidst the tea, the bread and the biscuits, is the succor required to endure this bitter reception into winter. The biscuits, if you haven’t already noted, are Asian-inspired, and after a quick glance at the list of ingredients you would be fooled into thinking that this is a recipe for an aromatic Thai broth. In particular, the lemongrass, ginger and cardamom all blend to create a wonderful spicy and fragrant biscuit that is almost likely to make you forget about what’s going on outside. 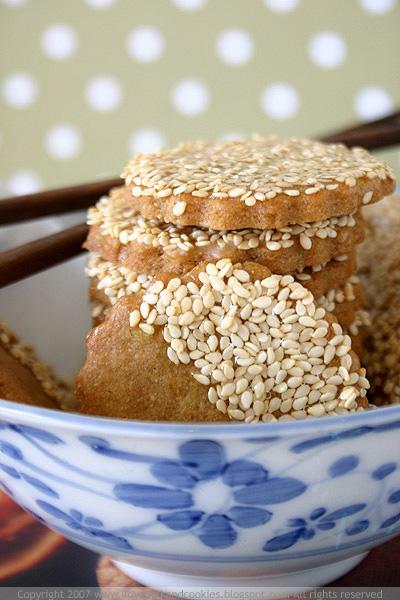 The thin layer of toasted sesame seeds on top provides a nutty contrast to the subtle sweetness of the cookie. This cookie isn’t as moreish as those other ones, and a couple of mouthfuls is enough to satiate your inner cookie monster and not to mention is a great reprieve for your hips. The cookie dough also needs some time in the fridge to stiffen up for cutting. So it’s the perfect opportunity to make yourself a hot cup of whatever-you-fancy, perch yourself on the couch with a great book or a favourite TV show and wile away the wet weather indoors. When the weather is this tempestuous it’s good to have a solid plan B and these are just the thing. Beat butter and sugar in a bowl using an electric mixer until light and fluffy. Beat in spices and egg yolks until smooth. Stir in sifted flour and lemongrass. Roll dough between two sheets of baking paper until 5mm think; refrigerate for 30 minutes to an hour. Preheat oven to 160°C. Prepare a baking tray with parchment paper. 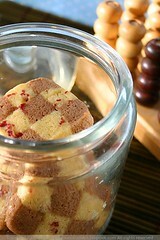 Using a cookie cutter, cut shapes out from the dough. Roll up remaining dough and repeat procedure. Place on baking tray about 5 cm apart. 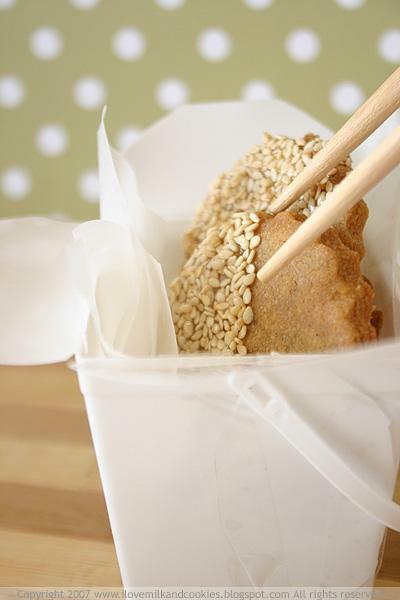 While the cookies are cooling, make the sesame seed topping. Toast the sesame seeds on the oven at 200°C for about 5 minutes. Watch carefully just in case they toast quicker than 5 minutes. In a small saucepan over medium heat, dissolve sugar and water just until the sugar begins to turn brown, remove from heat. 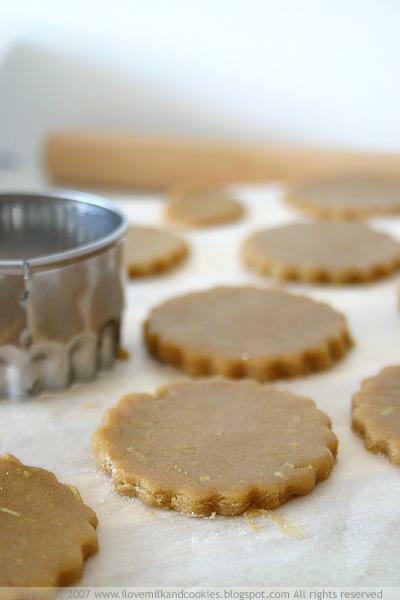 Using a pastry brush, brush the tops of the cookies with the sugar syrup. 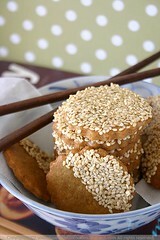 Turn the cookies, sugar side down onto the sesame seeds and make sure they are coated evenly. Return to wire rack to set. 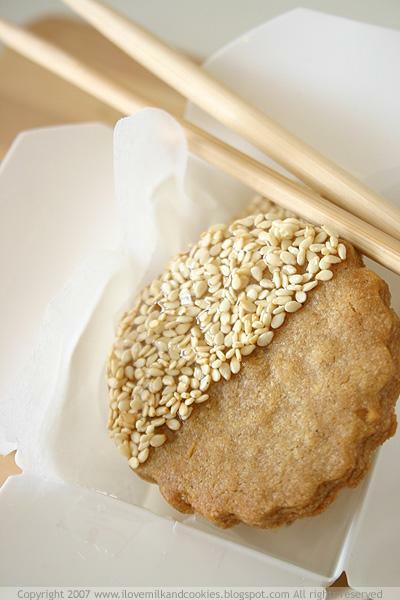 After you have coated all the cookies with sesame seeds, use the remaining sugar syrup to gently coat the tops of the cookies to seal the seeds. A week has come and gone, the heavens have opened, the sun has shone and the rains have returned. The city is once again covered in a mantle of grey clouds, and is perhaps bracing itself for another destructive run. The rains’ homecoming was at first received gladly, although now that it has left our state with a potential billion dollar clean up bill, we are hoping that Mother Nature eases up a bit. 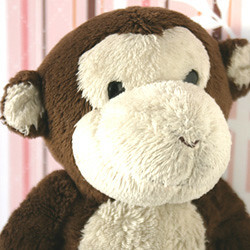 Bring on the rains but hold off the floods and gale force winds please. If only the weather was as easy as ordering a chicken chow mein at your local take away; but unfortunately we have to take what can get. Now although it’s great that we are finally getting some rain, what comes with it isn’t always that agreeable. The temperature has dropped and it is officially freezing outside, the hems of my jeans always seems to get wet no matter how high my shoes are, the ground is eternally muddy and my hair in a perpetual state of frizz. Now it may seem that this is just a lot of whining and it probably is; so what then is one to do when one is not in the disposition to contend with the wet weather and all that comes with it? Well I say, you stay home in your frumpy house clothes, forget about glamming yourself up and going out, your mascara will probably melt in the rain anyway, so just stay indoors and bake up a storm of your own. Well that’s what I did anyway. 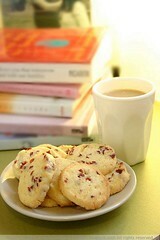 A few months ago, I bought an Australian Women’s Weekly cookie compendium aptly titled Cookies. I looked at it, read the recipes, intently pored over the luscious photography then became too overwhelmed by the amount of recipes I wanted to make. I don’t know if this ever happens to you but when I get a new cookbook, the visual and palatal stimulation sometimes becomes too much for my imagination that I have to take a pause and put the book aside and leave it for later. That is exactly what happened to this book, it was shelved until my senses could cope with the cornucopia of sweet sights and ideas. Now the question was which recipe would I make first? Well it so happens that on this particular rainy day, my pantry was going through a stocktake and clen out that was long overdue. I found jars of vegemite and packets of biscuits that had expiration dates literally from another millennium. I don’t know why I felt the need to hold on to packets of Le Snack from 1998 but nonetheless they were stashed in there as though waiting to be used as rations after some sort of nuclear fallout. But aside from displaying my adeptness at hoarding food like a squirrel, I found a packet of dried cranberries hiding behind an expired jar of Vegemite. 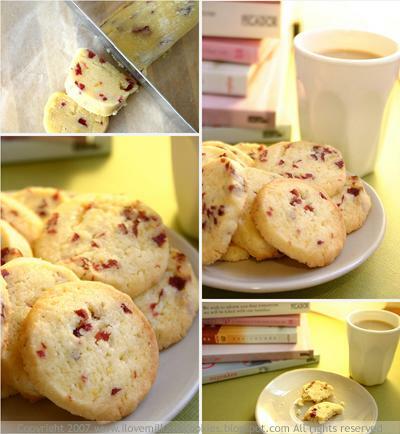 So I decided to make a batch of Lemon and Craisin Cookies. Right now, I have this thing for slice and bake cookies. 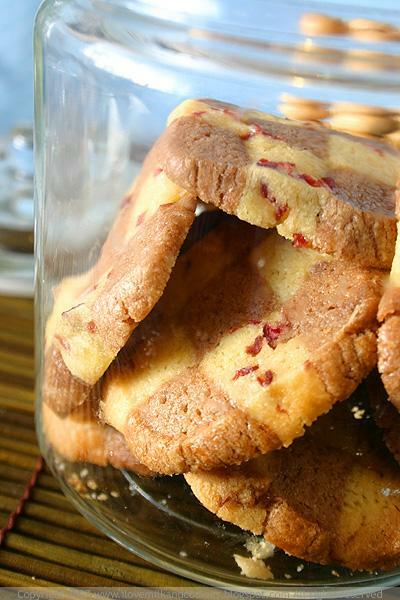 They are extremely versatile and you can keep some dough in the fridge if you don’t want to have an abundance of baked cookies hanging around that you can’t eat. I did slightly reduce the amount of sugar in the recipe by half and used caster sugar instead just because I had run out of icing sugar and wanted to retain a little bit of the tartness from the dried cranberries without losing the flavour in all that sugar. The Craisins are in fact already slightly sweetened, so you really don’t want to be eating yourself into a toothache. 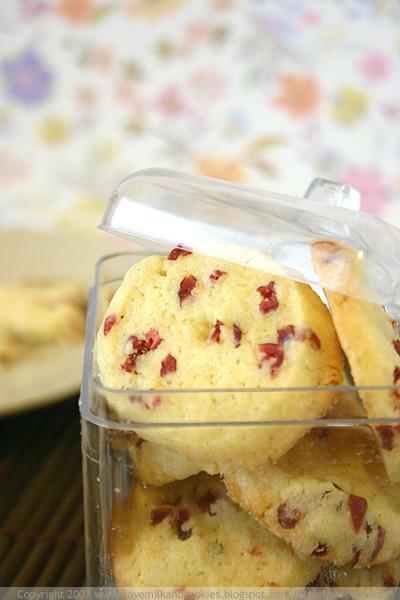 The recipe below is exactly like in the book, however you can reduce the amount of sugar in the recipe and still get a sweet aromatic cookie. When baked to cookies crisp up although still remain crumbly once you bite into them. The sweetness and perfume of the lemon and the tangy bursts of cranberry are one of the many reasons to make this recipe. I must say though that these little cookies are incredibly moreish, but it seems to me that I say this about almost every cookie I make. Either the cookies are in fact moreish or I am just a big glutton, I prefer to stick to the former but you be the judge. Here is the original recipe below. Beat butter, icing sugar, vanilla extract and lemon zest in a bowl with an electric mixer until light and fluffy. Stir in sifted flours in two additions. Then add the egg. Stir until the egg is incorporated and divide the mixture in half. Knead each half on a lightly floured surface until smooth. Roll each half into a 25cm log. Wrap in baking paper and refrigerate for 1 hour or until firm. Remove one of the logs from the fridge and slice into 1cm discs. Shape into neat circles and place on the baking tray about 3cm apart. Bake cookies for about 15-20 minutes. 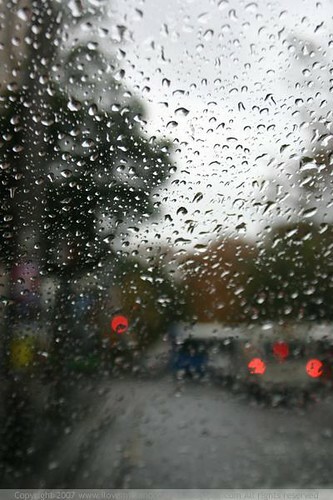 It’s Thursday morning; I hear the pitter-patter of raindrops against my bedroom window. It’s been a long time coming, but finally Sydney and pressumably the rest of the state receives a serious drenching that it has been waiting a long time for. I don’t think it’s safe to say that the drought has been lifted but it certainly was nice to see some moisture descending upon this dry state. I know I have never been happier to see a thick blanket of grey and a continual downpour, and I am sure many farmers were ecstatic too. No sooner than when I said that the winter weather has been “unusually clement” that we get a beating of gale force winds and heavy rains, let’s just say the weather turned inclement all of a sudden. I guess we all wanted it to rain, but the weather has been out of control. I know I’ll be spending my weekend curled up in a ball at home but I really don’t mind. On a sweeter topic, you have heard me harping on it before and here I am doing it again. 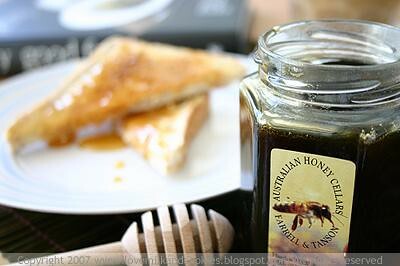 If you regularly attend the Good Living Grower’s Market, then you will probably be familiar with Australian Honey Cellars, and if you have been reading this blog for some time, then you might be familiar with my posts about Tasmanian Leatherwood honey here and here. Well the good news is that the honey people have launched a new online store, which means you can now buy their gourmand selection of Australian honeys online. Great if you can't leave the house because of the wild weather. 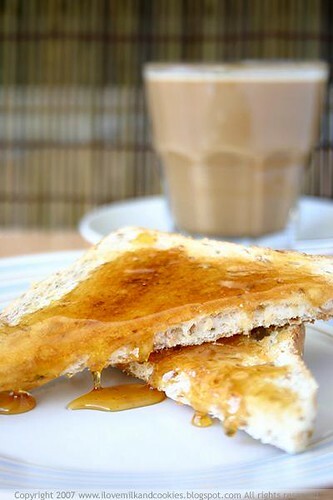 To finish this off, here is a gratuitous shot of some honey on toast to subliminally goad you into checking out the site. Sunday afternoons in Sydney are meant to be spent lazily, it’s almost mandatory, especially when our newly started winter season is unusually clement. Not that I am complaining but where have our Sydney winters gone? It seems that every year the winters get milder and milder. Could Mr. Gore be right about this inconvenient truth? Well, wherever it is our winter has run away to, it has given Sydneysiders the rare opportunity to enjoy a June weekend outdoors unladen with the burden of a thousand layers of clothing. So what do you do when you have become locked away indoors working on a Sunday afternoon while everyone you possibly know is either lounging at home, or enjoying the Primo Italiano Food Festival? The obvious answer would be to throw yourself a pity party and wallow in that pool of despair that you have created for yourself. Perhaps sit in a dark corner crouched in the foetal position passing the hours pondering on how much more pitiful your weekend can get. I know that’s exactly what I wanted to do every time I looked out the window, I could feel mother nature shining the sun in my eyes as if to spite me for not being outside to enjoy her good bidding. Nonetheless I was trapped, so the only thing to do was to bring my lazy Sunday lunch to work with me. I found the perfect lazy recipe from Simply Recipes, that endorsed the philosophy that food needn’t be fussy to be tasty, namely “low-supervision, high-flavour”. That was exactly what I was looking for, for my lazy lunch at work. I had enough busy-ness throughout the day to be bothered with cooking a special meal, so this was made the night before and then packed in an airtight container ready to heated up and plated the next day. But what is a lazy lunch without a lazy dessert? This brings us to a Donna Hay creation- Caramel Self-Saucing Puddings. There’s nothing better than a pudding that sauces itself. It does half the work for you. All you need to do is combine the ingredients for the batter, whisk up the sauce and pour it on top then bake. You have yourself a decadent dessert without all the fuss. They great thing about his pudding that it stays moist the next day, so a quick zap in the microwave (covered) brings it back to life. Although the dishes were made the night before, they held up pretty well after a short stint in the fridge and then in the microwave. Of course if you decide to make this for yourself you won't have to wait all that time before you can actually enjoy it. But if ever you need to pack yourself some good food then this is definitely a great pick. So as soon as the clock struck 12, noontime last Sunday, I bolted for the kitchen, got a few pieces of crockery to take my modest fare a fine dining experience, pulled out my latest piece of eye candy and pored over a great lunch and a great book. Here’s to great lunches and lazy Sunday afternoons! In a large pot combine all of the ingredients, giving a quick stir to submerge potatoes into the stock. Over medium heat, simmer the pot uncovered for about 35 minutes or until the potatoes are cooked all the way though and tender. 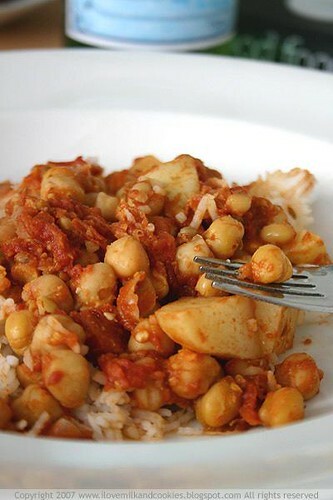 Serve curry over some Jasmine or Basmati rice. To make the pudding, beat the sugar, butter and vanilla in a bowl until light and fluffy. Add the flour, baking powder and milk and beat until combined. Spoon the mixture into a square ovenproof dish and place on a baking tray. 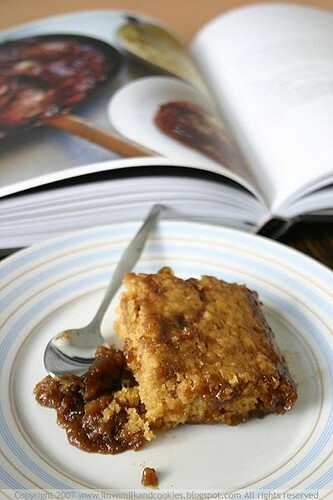 To make the sauce, whisk together the water, brown sugar, molasses, maple syrup and flour until combined. Spoon the sauce over the pudding batter and bake for 35 minutes or until golden brown and set.